"My mom used to make these when it was going to be a busy night. Now I make them for my daughters busy nights." Place ground beef in a large, deep skillet. Cook over medium high heat until evenly brown. Drain excess fat. Stir in pizza sauce, and heat through. Spoon onto buns and top with cheese. Microwave for 15 to 20 seconds, or until cheese is melted. See how to make juicy burgers with the cheese melted right inside the patties! i wasn't a big fan but im sure kids would be. I decided to wrap the sandwiches in foil and bake them in the oven at 400 for 5 or so minutes. It melted the cheese & made the buns toasty! Quick and easy, but next time I'll use a spicier pizza sauce and add some chopped onions. Wonderful recipie! I used ground Italian sausage instead of ground beef and added pizza cheese & red pepper flakes to give extra flavor. Everyone loved it, I'll be making this again. Super simple. 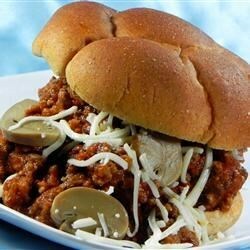 A nice twist on sloppy joes. My kids loved them. I will definitely make this occasionally. YUMMY...I USED PEPPERONI PIZZA SAUCE AND ADDED A LITTLE BIT OF JALAPENO TO GIVE IT A LITTLE KICK.